Human Kinetics Publishers, 9780736040211, 320pp. High-Performance Cycling is all about going faster and pushing the limits of your ability. 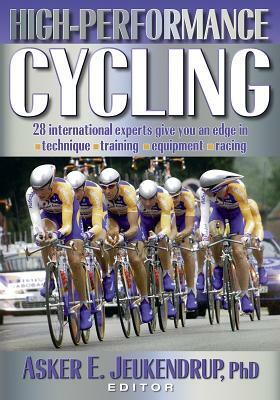 If you want the latest training, equipment, and technique used by the best cyclists in the world, then this is the book for you. - stay-injury free and avoid the pitfalls of overtraining. Asker E. Jeukendrup is a recognized authority on biochemistry and exercise physiology for cyclists. He has served as scientific adviser to the Rabobank professional cycling team--one of the top cycling teams in the world--and as nutrition consultant to U.K. Athletics and numerous Olympic athletes. More than 50 of his articles have been published in peer-reviewed journals.Jeukendrup received his PhD in health sciences in 1997 in Maastricht, Netherlands, and is currently a lecturer in the school of sport and exercise sciences at the University of Birmingham in the United Kingdom. He was already an avid cyclist when he first entered the fields of exercise physiology and sport nutrition. In his work, he endeavors not only to perform cutting-edge research but also to translate his findings into terms that will be directly useful for athletes. In his free time, Jeukendrup enjoys cycling, traveling, and competing in triathlons. He and his wife, Antoinette, live in Birmingham, England.